Amazing Days, Endless Nights: The Mystique of Surgery 3 is the third book in a series by David Gelber, a book that lifts the veil and allows readers glimpses of the operating room. It is a wonderful homage to surgeons and to doctors who spend sleepless nights and long hours in the operating room "all in the effort to mend broken and diseased bodies and souls." The author shares his experiences, at times humbling and sometimes harrowing, through medical school, moving to residency, and to his private practice. The surgeon takes readers through intimate moments from medical school, through learning and into practice. The reader meets a professional in his field and the mystery of mending broken bodies. The reader meets a skilled surgeon and follows him through his rapport with patients, discovering his deft hands that could tie a knot pretty fast. This book allows readers to see and feel what a surgeon sees and feels in the operating room. While this book provides experiences that will entertain readers and inform them, it also has a powerful psychological underpinning, allowing readers to experience the tension and the strain of working on patients whose lives hang in the balance and depend entirely on the surgeon. Amazing Days, Endless Nights kept me up through the night and although it is written by an expert in the profession, the language is very accessible and the prose delightful. There is a lot to learn from this book in addition to the revelations it offers about surgery, including dedication, the sacredness of life, the complexities of the human body, the relationship between doctor and patient, and a lot more. 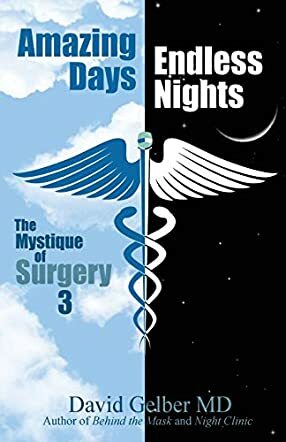 Amazing Days, Endless Nights: The Mystique of Surgery 3 is a work of non fiction focusing on contemporary medicine, penned by author and MD David Gelber. Lifting the lid on what it’s really like to be a surgeon, this third instalment in Gelber’s true life story takes readers back into the OR for a new series of cases. From the complex to the mundane, the case files cover everyday procedures, scheduled in the daytime, to help people recover and move on with their lives. Then, when the night-time surgeries take over, horrific emergencies, accidents and attacks are brought into Dr Gelber’s hands, where life and death really do hang in the balance. I think fans of real life accident and emergency shows are sure to enjoy this book, especially to see everything directly from the surgeon’s perspective and with his expertise in the field. David Gelber MD writes with fluidity and clarity, and has a clear intention to simplify medical terms and give his readers the best ‘view’ into the surgery possible, even if they have no prior knowledge of the different cases he meets. The work is well organized into case by case encounters, and Gelber’s thoughts and reflections can be both practical and heartfelt, showing the emotional strain that surgeons have to go through every day, as well as their incredible talents. Overall, Amazing Days, Endless Nights: The Mystique of Surgery 3 is an excellent work for anyone interested in medical procedures and lifesaving, moving drama from the real world. Amazing Days, Endless Nights: The Mystique of Surgery 3 by David Gelber MD is a non-fiction memoir of a doctor’s experiences in the surgery room. Amazing Days, Endless Nights starts off by jumping into medicine and the world of doctors right away. The book narrates David’s experiences from his early student and residency days and continues to his later years, by which time he was an expert surgeon in his areas of the field. Each chapter of the book deals with a specific event at a certain period in his life and narrates what his day to day experience was in dealing with the event, whether it was long shifts, a medical emergency requiring surgery, or just unexpected or unanticipated events that are quite common in the field of medicine and how they were handled. I enjoyed reading Amazing Days, Endless Nights since it gives a firsthand account of what it’s like to be a surgeon in America. The book is written in the first person and lends authenticity to the narrative. What I enjoyed most about the narrative was the slightly humorous style of writing which makes the book entertaining while at the same time maintaining respect for a patient’s health. Although the book contains plenty of technical terms and medical jargon due to the nature of the subject, it is still very readable and David’s take on the subject itself is very engaging and targeted towards the layperson audience. Overall, I enjoyed getting a glimpse into the behind-the-scenes of an operating room.